World Cup Recap: Vive La France! The finest World Cup in memory ended with France winning 4-2 over Croatia. This capped off a wonderful month of soccer on the world’s top stage. Here’s a final recap of the World Cup. Not surprising after the group stage I felt, France ,Croatia and Belgium were the best teams. They showed that for the rest of the tournament. The final had everything you would want. Six goals in a final was amazing. For the first 50 minutes I thought Croatia had the better of the play even though they were down 2-1. France’s depth played out and they showed why they were the best team. Croatia had nothing to be disappointed in. They were the second smallest country ever to make it to a final. There midfield play was extraordinary for the entire tournament. In the biggest games you need your best players to show up. For France all three of their stars showed up and scored. Kylian Mbappe, Paul Pogba and Antoine Griezman all scored in the victory. France wins their second World Cup. 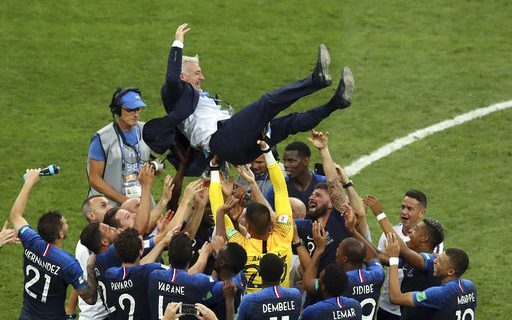 In 1998 their coach Dider Deschamps hoisted the cup at home as a player. He now joins Germany’s Franz Beckenbauer and Brazil’s Mario Zagallo as the only players to win the World Cup as a player and a coach. The golden boot will go to Harry Kane of England. Kane scored six goals in the tournament. Kane helped England over-achieve and settle for fourth place in the tournament. England has to be happy with that showing. Kane’s six goals were two higher than anyone else in the tournament. The golden ball for best players in the tournament for me came down to France’s Kylian Mbappe and Belgium’s Eden Hazard. In both cases it was speed that puts them in this spot. Hazard amazed me with his ability to have as much speed in the 90th minute as he did in the first. Hazard controlled Brazil with his speed. Brazil had no answer for his combination of skill and speed. With France winning the honor for me would go to Mbappe. In the final he deserves some credit for not only scoring but setting up Pogba’s goal with his speed wide. Mbappe’s two goals vs Argentina were first class in an elimination game. Mbappe did win the FIFA young player award. Instead they gave the golden ball to Luka Modric of Croatia. Modric helped control the middle for Croatia in the tournament. He scored two goals in their thrilling victory over Russia. In terms of ground covered it was Modric that covered more ground than anyone in the tournament. A worthy candidate for sure but in my eyes not as good as Mbappe or Hazard. Portugal 3- Spain 3– set the tone early in the tournament. Ronaldo scored the hat trick to help Portugal salvage the tie. An awesome performance from one of the world’s best. Germany 2- Sweden 1– with their backs against the wall after a loss to Mexico Germany guts out a win in the last minute with a goal from Toni Kroos. Belgium 3 Japan 2– Belgium down 2-0 in the elimination stage turns in on in the last 25 minutes. Three goals sends Japan packing and for me the game of the tournament. France 4 Argentina 3– Mbappe has two goals in this thriller. Messi goes home but not without a fight. Fun game to watch. Belgium 2 Brazil 1– Belgium jumps out to a 2-0 lead and hangs on for the win. Brazil was the favorite coming in but they appeared to be flawed from the start. Biggest memory of the tournament for Brazil will be Neymar flopping on the ground. Embarrassing! The story of the tournament has to that of Belgium’s Romelu Lukaku. His story was heart wrenching. Growing up dirt poor. When I say dirt poor I mean dirt poor. He played every game growing up like it was the World Cup final. He overcame prejudice in his own country before coming a national hero. Someone you really root for in life.